Baby’s First Haircut or Bowl Cut? The reason my little girl looks like a boy at the moment is not entirely my fault. My husband is away a lot for work so he misses a lot of “firsts”. Obviously, I don’t tell him that and act like all milestones are the first time in front of him. Usually I can keep up this charade but my deception finally caught up with me. My husband has asked me several times not to cut our daughters hair. Something about her being a girl and blah, blah, blah… I just couldn’t stand her hair getting caught in her snot and being in her face any more. One day, I decided I was tired of the mullet and I was going to trim it. Just enough so he wouldn’t notice and she wouldn’t look homeless. I don’t know why I would think I could pull it off with no experience and humongous kitchen scissors. Instead of being stealth, I chopped enough to give her the worst bowl cut I have ever seen! 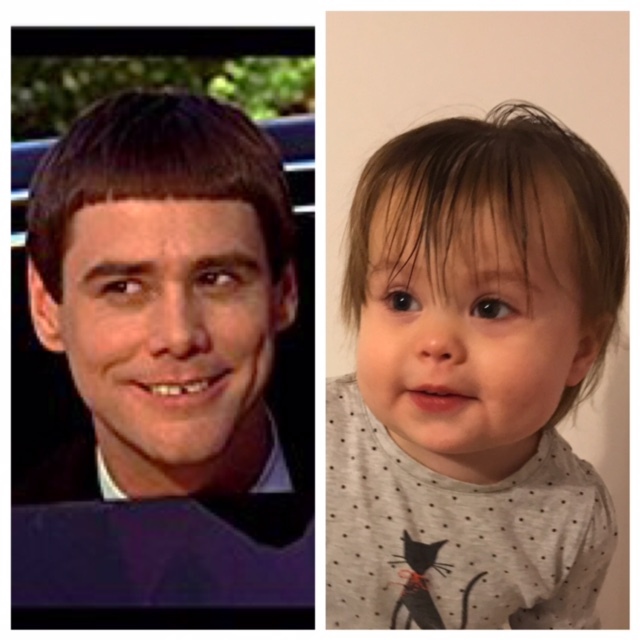 I don’t what’s worse, keeping secrets from my husband or Audrey’s Lloyd Christmas haircut!